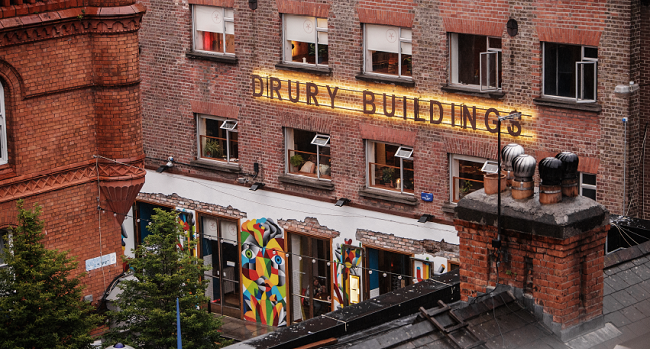 Drury Buildings is a mish mash of Berlin exterior, New York interior, and is located in the heart of Dublin’s Creative Quarter. They feature fine wines, classic cocktails, craft beers and some really cracking Italian food. This six story and forgotten trade building in Dublin city centre, has been refurbished to create both a unique and intriguing restaurant and cocktail bar. By mixing a load of reclaimed bars, floors, doors, church benches, glass, timber and steel from New York, shaken with 2 years of hard graft, Drury Buildings was born. Experience the extraordinary culinary skills of Warren Massey in their upstairs restaurant. To celebrate the launch of their new Pre-Theatre Menu, Drury Buildings is offering TheTaste readers a 3 Course Dinner for Two People plus Two Glendalough Gin and Tonics for €60. Drury Buldings new Pre-Theatre Menu is available Monday to Wednesday all evening, and Thursday to Saturday from 5 – 6.45pm. – 24-hour cancellation policy. If you can’t attend, cancel or reschedule your booking at least 24 hours before the agreed time to avoid loosing your voucher.